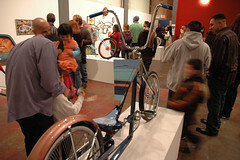 These two artists from East-side San Jose combine their metal working skills, street art aesthetics and formative years of hanging out in arcades, laundry mats, and liquor stores to create an unprecedented exhibit of custom made lowrider bikes for a new generation. “It’s hard to articulate who we are, but I guess the same could be said about the sights and sounds in today’s hybrid-style culture. When Matthew and I were teens it was the mid and late 90’s. Everything was hot, violent, and seemed to be nicely categorized; you had skaters, stoners, cholos, breakers, taggers, etc. Amongst these, our ghetto hall passes. For Matthew, lowrider bikes, and for myself, tagging on buses, and freeways. Both lifestyles showed us something beyond our insignificant piece of the east side. The process in making this show brings me back to arcades, laundry mats, and liquor stores. It has to be these places that are the source of our work. Where kids would get together to play Street Fighter 2, catch wreck on bus windows, go to a lowrider bike show, or watch cartoons.